As we build up to the much anticipated December opening of Unveiled: 200 Years of Wedding Fashion from the Victoria and Albert Museum, London, it is time to ‘unveil’ our three New Zealand designers! As part of the exhibition Te Papa has commissioned three very different New Zealand designers to create their idea of the ‘ultimate’ wedding gown. 2011 has proved to be a high-profile year for each of our chosen designers, and Unveiled is bound to provide the perfect finale. Our first designer is a dedicated bridal specialist. Throughout her career she has dressed over 5000 brides! While most of us relaxed in front of the telly with a glass of wine to watch Prince William and Catherine Middleton’s wedding on 29 April, this designer was glued to the screen, noting down every element of the dress that she could see. 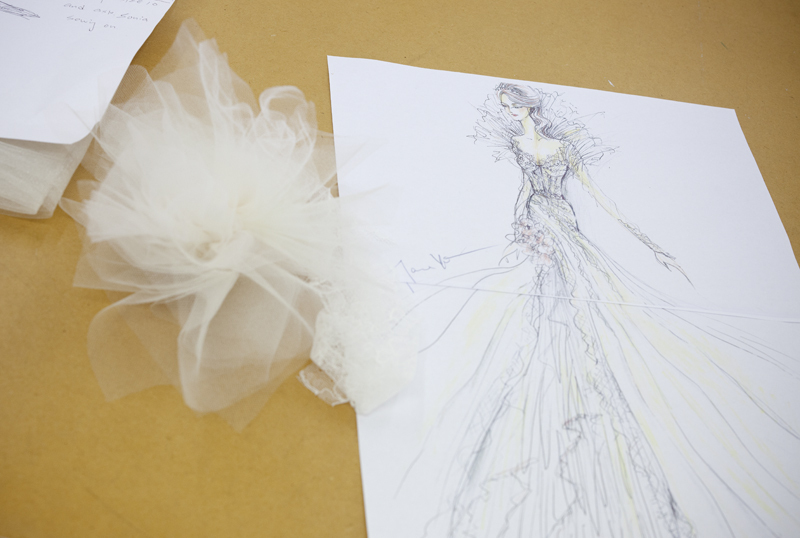 It was Jane Yeh’s job to recreate the year’s most anticipated wedding gown within just 12 hours! Jane Yeh in her Parnell workroom, Auckland. For Te Papa, Jane is doing what she does best, making a wholly romantic gown fit for a glorious summer’s day wedding. She even promises butterflies! Dedicated to combining Pacific and European textile traditions, and with a talent for magically transforming materials, Lindah made this garment from calico and flax. For her wedding gown she is working with tapa cloth from Tonga and Samoa. While we are not expecting anything quite as radical as Bushygaga, we can assure you it will boast the same wonderful dexterity of making that is a hall-mark of Lindah’s work. The final design company in our New Zealand section comprises of not one but three designers – Francis Hooper, Denise L’Estrange-Corbet and Benny Castles. Together they make up WORLD. As WORLD designs both women’s and menswear for the ready-to-wear market, we asked them to design ‘his n hers’ wedding outfits. While the groom’s ensemble is still on the work table, the ‘bride’ made her national debut at New Zealand Fashion Week in September. The dramatic show doubled as the finale of New Zealand’s Next Top Model. As can be expected, WORLD’s bride is no ordinary bride. She is a sophisticated winter bride, sheathed not in white, but in a figure hugging black, dazzling with crystals. Behind the scenes at WORLD’s NZ Fashion Week show, Good Vs Evil. WORLD’s menswear designer Benny Castles has the task of designing the groom’s outfit. Having staunchly declared that his groom will not be overshadowed by the bride we wait with anticipation to see Mr Castle’s design unveiled in December. Speaking of which tickets are now available for sale via Te Papa’s website – they’ll make great Christmas presents for those who already have everything! And if you are looking for a beautifully illustrated summer read Edwina Ehrman’s book Wedding Dress: 300 Years of Bridal Fashion is available from the Te Papa Store. It got a great review in Graeme Beattie’s book blog.